On Friday, the president, who is spending the holiday at his Mar-a-Lago resort in Palm Beach, Florida, hit the links at his nearby club for the sixth day — a golfing streak only interrupted by Christmas Day on Dec. 25. NBCNews.com and the NBC News White House unit are tracking Trump's visits to his properties and golf courses since his inauguration. Trump's trips have so far been concentrated in Palm Beach, Florida. He also took a 17-day "working vacation" in August, spending 15 days at his Bedminster, New Jersey, golf club and two days at Trump Tower in Manhattan. He also frequents his golf course in Washington, D.C. — and sometimes will visit multiple properties on the same day. Trump has visited his golf clubs nearly 90 times in his first year. However, the precise number of times Trump has actually played golf is difficult to track. His administration has tried to hide Trump's activity, keeping his traveling press pool away and often refusing to confirm whether he has played golf. Instead, social media has become a source of crowd-sourced reporting into the president's whereabouts. 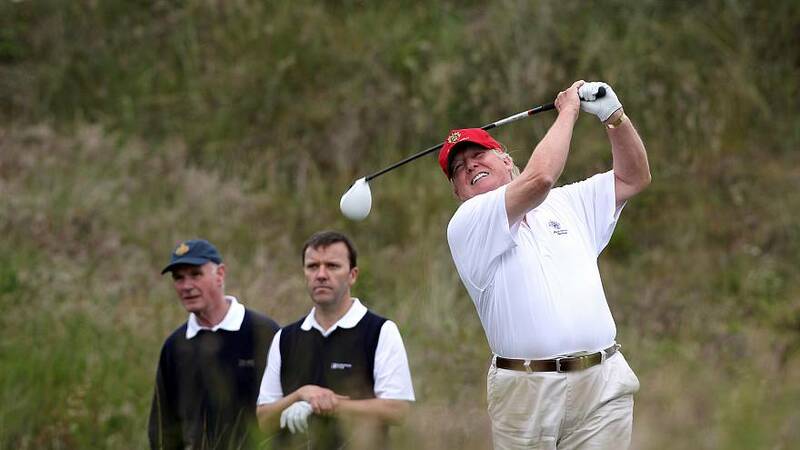 But more than four months into his term, Trump has visited golf courses at a faster clip than his three most recent predecessors, according to The New York Times. Politifact reports that as of November 2017, Trump is confirmed to have golfed 35 times, while at the same point in his presidency, Obama had golfed just 11 times. During the campaign, Trump argued that Americans should vote for him because he would rarely leave Washington. He promised that he wouldn't go golfing or take vacations because there was too much work to do. With the exception of his 15-day stay at his golf resort in Bedminster, Trump usually frequents his properties on weekends. Trump has referred to his Mar-a-Lago club in Palm Beach, Florida, as the "Southern White House" — and that's where he's hosted foreign leaders like President Xi Jinping of China and directed the launch of a strike against a Syrian airbase. His most recent visit, however, was over the Christmas holiday, which featured near-daily jaunts to nearby Trump International Golf Club in West Palm Beach. How much does Trump's travel cost? The president's trips can cost taxpayers millions of dollars because of the use of Air Force One and the expenses of the Secret Service, the Air Force, local sheriff's departments, the Coast Guard and other agencies. However, a precise accounting can't be made because the expenses aren't required to be disclosed. In response to a recent report in USA Today that Secret Service's funding problems were partly caused by the president's large family and their multiple, oft-visited Trump properties both in the U.S. and overseas, agency director Randolph "Tex" Alles said it was not an issue "that can be attributed to the current Administration's protection requirements alone." Presidents other than Trump incurred similar questions about travel costs. Much of what is known about Obama's travel costs was obtained by the conservative watchdog group Judicial Watch, which aggressively sought receipts through Freedom of Information Act requests. In October 2016, the Government Accountability Office (GAO) issued its own report breaking out the costs of one specific trip taken by Obama, finding that a trip to Chicago and Florida cost $3.6 million. This tracker automatically counts Trump's days in office. When Trump arrives at one of his properties, the tracker updates accordingly.